We take a look at what the 17 teams in the World Tour will be wearing for the 2015 season. Some have changed, some haven’t; some are good and some are, well… Marmite. The 2015 World Tour season (think Premier League of men’s professional cycling with all teams in it automatically entered into the world’s top cycling races) kicks off in less than a week at the Tour Down Under in Australia. Here’s a bunch of pics of the 2015 cycling team clothing and our fashion critique of each. The Marmite of pro team cycling kits remains as Ag2r-La Mondiale keeps with their trademark brown and white colours. Virtually no change for 2015 which should keep the haters and likers happy in equal measure as it gives them something to converse over. At least they’re still easy to spot. 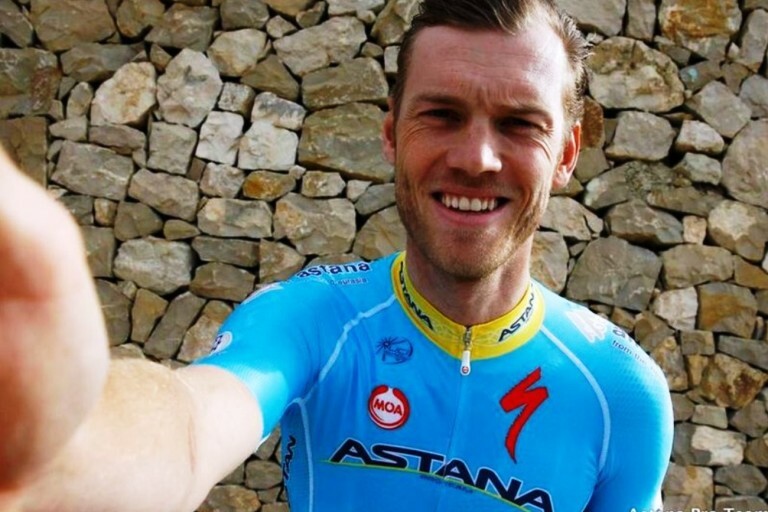 The baby blue of the national flag stays but the Astana logo shoulder flash goes. Looks like it’s a solid blue colour for jersey so should be the same for the shorts. Tour de France winner Vincenzo Nibali’s squad looks to be another with an update to existing kit and means we should still be able to easily spot the distinctive blue in the bunch. 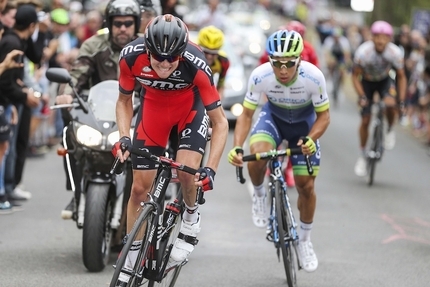 We can’t spot any changes to the 2015 kit for BMC Racing as the block red and black remains with white lettering. We like the simplicity of this design and lots of red makes them easy to spot. With the merger of the Cannondale and Garmin teams for 215 many we all waited to see which colour or design would take preference. 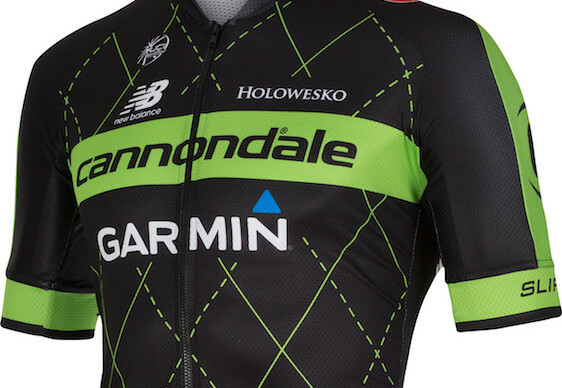 As major sponsor, the well known lime green of the previous Cannondale team was chosen over Garmin’s blue but a hint of the Arggyle pattern remains in the new colours. Apart from a sponsor name change (Omega Pharma becomes Etixx), the 2015 Etixx-QuickStep squad kit remains unchanged from the black, blue and white Omega Pharma-QuickStep kit of 2014. 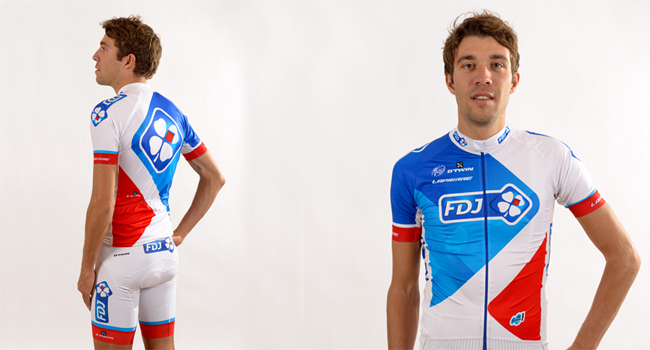 FDJ.fr move away from the blue to a predominately white but nationalistic looking red, white and blue of the French Tricolore. How the white shorts will fare in the early season Classics and wet grimy days we’re not sure though. 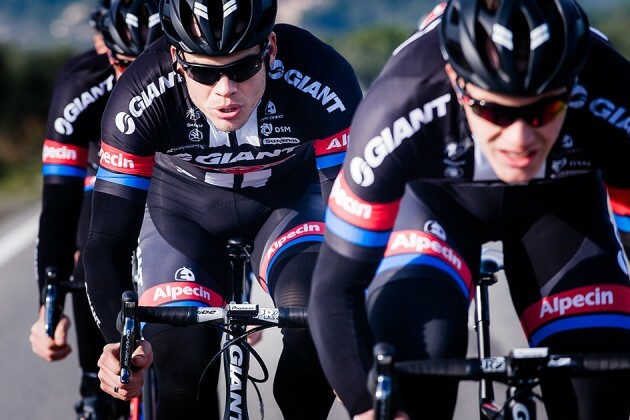 Giant-Shimano becomes Giant-Alpecin for 2015 and along with the new sponsor comes a new kit. The previous black and white is now all black apart from two vertical white stripes in the centre and red and blue bands on the sleeves and shorts to take break up the starkness of the dark kit. 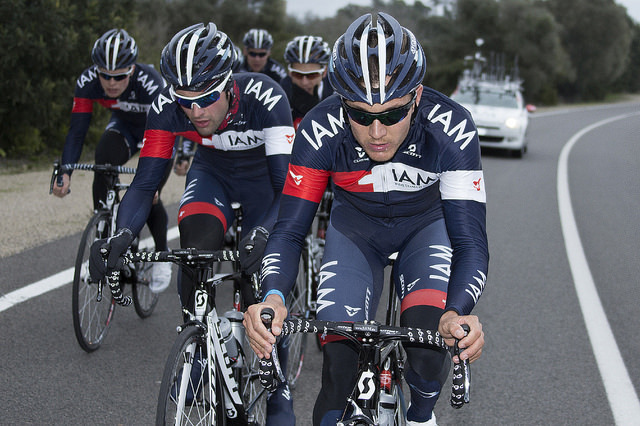 IAM Cycling has stepped up from the second division to WorldTour level for 2015 but the kit remains the same. Only change is that rider’s names appear in bigger letters on the back of the jerseys with the slogan IAM followed by the rider’s surname underneath making them easy to spot for other riders in the bunch as well as autograph hunters off the bike. Another team who have gone for more white on their jerseys for 2015 is Katusha. The red and blue stripes as well as the red shorts remain so it’s good to see them updating their traditional colours. Lampre-Merida haven’t announced their 2015 kit yet but we can’t imagine it changing much from the 2014 version as the sponsors iconic colours of pink and blue and lime green stay the same. 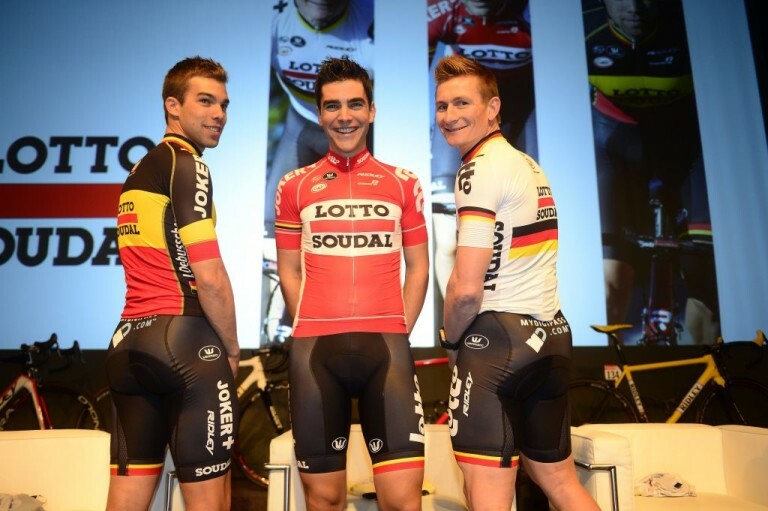 The secondary sponsor may have changed but the kit stays pretty much the same for Lotto Soudal (formerly Lotto Belisol). The retro inspired block red jersey and black shorts remain with the new sponsor’s name being the only change to a kit we like. 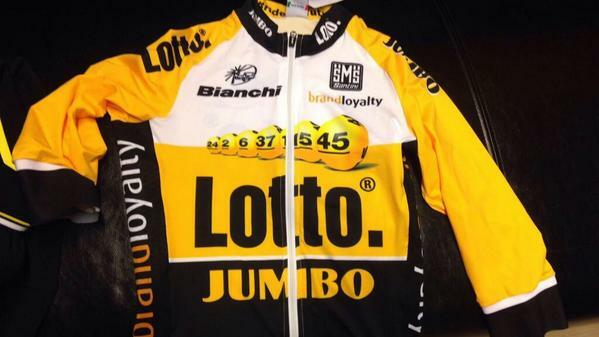 Team LottoNL-Jumbo is a new team for 2015 (was previously Belkin) and so a completely new kit. The old green, black and white has been ditched in favour of a much brighter orangey yellow and black affair. Thankfully the shorts are all black apart from a matching yellow band at the bottom of the leg. As far as we can tell, the only change to the blue and flo green kit for the coming year is the removal of the green bands at the ends of the sleeves and shorts. Apart from that it is identical to the 2014 kit, all sponsors stay the same as well, which is good as we think this is one of the best kits in the peloton. We can’t tell any difference between the 2015 and 2014 kit for Orica-GreenEdge so looks like business as usual for the Australian squad. 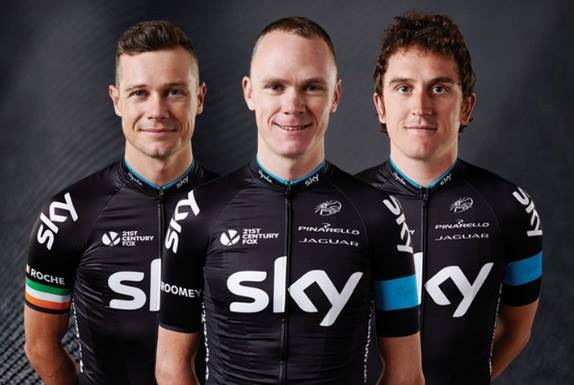 Virtually no change for the original boys in black for the coming year. The only difference we can make out so far is the addition of a small blue band on the top of the collar and everything else stays the same. The yellow and blue colours remain but with what looks like a lighter yellow. There’s also more yellow as the blue has gone from the bottom half of the jersey but the blue shoulder panels stay the same. There’s a lot more white on the 2015 jersey for Trek with both shoulders and sleeves solid white which should make them stand out a bit more among the many darker coloured jerseys in the peloton. The pinstripes appear to have gone from the jersey on the lower half which is now solid black but are still prominent on the shorts. Tagged froome, jerseys, orica-greenedge, racing, sky, team jerseys, tinkoff-saxo. Bookmark the permalink.